Messrs., John Holdsworth & Co., Worsted Spinners & Manufacturers, Government & Railway Contractors, Shaw Lodge Mills. If a long continuity of successful business operations, coupled with a very high standard of goods produced, be in any way a criterion by which the reputation of an industrial concern may be gauged, we have no hesitation in assigning very high rank indeed to the firm we name at the head of the present sketch. Of Messrs. John Holdsworth and Co., of Shaw Lodge Mills, Halifax, it may justly be said that the concern possesses in a conspicuous degree all those essential features which characterize a house of thoroughly typical character and first rate importance. The various productions of the firm are noted at home and abroad for excellence of texture and beauty of finish, and are held in high esteem in all the great markets of the civilised world; some of the productions in cloths, reps, etc., being supplied under contract in very large quantities to the British, colonial, and foreign governments, railway companies, etc. In order to meet this immense demand it is scarcely necessary to say that the firm possess vast resources, and indeed, for many years the ever increasing development of the trade has necessitated repeated extensions of the premises, as well as additions to the equipments, until the mills have now assumed gigantic proportions, and afford an example of organized technical industry not surpassed anywhere in the Yorkshire textile trade. From the very beginning the firm have shown exceptional enterprise in the administration of this great undertaking, and have never allowed any question of expense to stand in their way in adopting or introducing improvements. 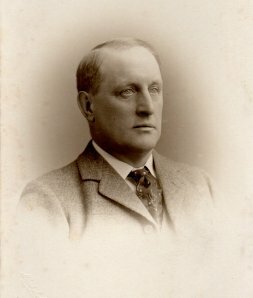 As a result they enjoy an undisputed supremacy in several branches of textile work, with the result that the name and trade mark of John Holdsworth and Company have a distinctive prestige both at home and abroad. The house was founded in 1830 by the late Mr. John Holdsworth, who was subsequently joined in partnership by his four sons. The sole proprietor of the business at the present time is Mr. Clement Holdsworth, the founder is grandson, who since the year 1885 has held exclusive control, and has greatly developed the business and enhanced the prestige of the house. Under his enterprising administration the latest improvements in equipments and methods of working have been introduced, costly plant, machinery, and labour-saving appliances of the most improved and ingenious character have been added in the several departments, and the general organization has been brought to a remarkable standard of perfection. In fact nothing that long experience and great engineering skill can do seems to have been overlooked in securing the maximum of efficiency and economy in every detail, and the whole of these colossal works, with their many departments and elaborate equipments, are now worked with the smoothness, regularity, and precision of clockwork. Indeed, the premises as a whole afford a striking illustration of the fact that it is only in great comprehensive undertakings that perfect organization, with the maximum of efficiency and economy in working, can be attained. The works are practically self-contained, including all the departments and resources necessary for preparing and manufacturing the wool from the raw state until it is sent out as a highly finished fabric, with the sole exception of dyeing. In addition, the works contain many important subsidiary departments, including private gas works and large engineering shops for the repair and maintenance of the plant and machinery, thus leaving the firm practically independent of external aid. The premises comprehended under the title of Shaw Lodge Mills consist of three large mills and a vast weaving shed: the main building reaches an elevation of six, the warehouse of seven stories, while the range of weaving sheds have a frontage extending over 400 yards in length. In passing - however cursorily - in review these immense works, it will, for reasons quite manifest to the reader, be impossible to convey anything like an adequate idea of the magnitude and completeness which are the most striking features of these palatial centres of industrial enterprise, much less to give a detailed and exhaustive description of their vast equipments and many interesting operations. 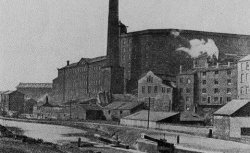 However, as we have recently had, through the courtesy of Mr. C.Holdsworth, the privilege of looking over the Shaw Lodge Mills and warehouses, we will here select from our notes a few interesting facts as regards their internal economy. The gigantic wool warehouse, of which we give an illustration, forms the first department in order. It is a lofty, massive building, covering an area of 11,000 square yards, and affording immense storage accommodation, with every convenience in the way of hoists, shoots, etc. Here the wool is received in the fleece, raw and dirty as it leaves the sheep is back, and large consignments are received daily from the different markets. It is first unpacked and sorted, and then sent through a shoot to a large cleansing department on the floor below the receiving-room. Here it is thoroughly washed and purified with the aid of a costly plant of washing and scouring machinery of ingenious construction dealing with an average of over 400 packs per week, and after it is dried, it is passed on to the next department. This is the combing-room, a partial view of which is given in our illustration. The room altogether has a superficial area of 1500 square yards, and is equipped with nineteen large combing machines, with fifty preparing and balling machines, the whole equipment being of the most improved and complete character, and being driven by a steam engine of 150 h.p. The carding department, with its nineteen elaborate carding machines in rapid motion, is a busy and bewildering scene; and from here we pass on to the next great department, the spinning mill. Here there is a perfect forest of machinery, including 172 spinning frames, with drawing machines, of which there are about twenty sets, together with seventy-five warping reels, and sixteen winding machines, the whole presenting a marvellous spectacle of organized industry, the elaborate and costly machinery being almost automatic and working with incredible rapidity and precision. So perfect are the arrangements that notwithstanding the high rate of speed, it is impossible for any inferior or defective work to pass unnoticed, and the various yarns are unrivalled for uniformity, tensile strength, and general high quality. These yarns are rapidly wound into hanks, which are then stored in the yarn warehouse ready for the weaving sheds or for the market; for the firm not only spin all their own yarns, but also dispose of large quantities on the Bradford market, where they are much sought after for the use of weavers of high class worsteds, etc., in all parts. The weaving shed, owing to its amazing extent and vast and varied equipments, entirely baffles description. It has a continuous length of a quarter of a mile, one main driving shaft running right through from end to end, there being also sixty-six cross line shafts, and the motive for the whole department is supplied by a splendid new horizontal steam engine of 600 h.p. constructed by Messrs. Cole, Marchant, and Morley, of Bradford. The department contains altogether 350 looms of the most perfect modern types. They are elaborate and costly machines, fitted with the most ingenious modern improvements, and turning out work of the highest class. The productions, however, are wonderfully varied in texture and pattern, almost every individual loom turning out its own distinctive speciality, from the heavy carpet-like reps for upholstering railway carriages to the finest silk tapestries. At the different looms may be found in process of manufacture worsted damasks, dress goods, table covers, railway carriage cloths, reps, coatings, serges, silk draperies, tapestry table covers, curtains, Holbein tapestry goods, and many other fabrics in beautiful artistic patterns. Here, also, one can see the many card patterns ingeniously punched for reproducing the many beautiful designs in the various fabrics as they are turned out by the improved Jacquard looms. The engineering department alone gives regular employment to seventeen skilled hands, and is equipped with powerful steam machinery of the most improved type, including seven lathes, besides drilling, planing, slotting, and other machines, a steam hammer, and fully equipped smithies, etc. The entire premises are illuminated by gas made on the premises by the firm in their compact gas works - the annual consumption being about 7,000,000 cubic feet - and in fact the works possess almost all the resources of a complete and self-contained industrial colony. The various engines on the premises give an aggregate of 1600 h.p., and a staff of about 2000 hands is employed. The warehouses for finished goods are of great capacity, and the various spacious stock-rooms are heavily stocked with worsted yarns, as well as finished cloths, including Utrecht velvets, table covers, Holbein tapestry for railway window blinds, reps for upholstering the seats of railway carriages, coatings, cloths for the army and navy, and many other specialties, including the productions already mentioned. The firm contract extensively for British and foreign governments and for railway companies at home and abroad, and do an immense general trade, the shipping trade especially having enormously developed during recent years. The firm send travellers to various colonies, and have a resident agent in Melbourne for the whole of Australasia and New Zealand. Frequent journeys are made to the United States, where customers are called on personally, and in spite of competition and tariffs, Messrs. Holdsworth and Co.is American trade is a very large and rapidly increasing one. The firm have branch offices and depots at 24, Peel Place, Bradford, and 6, Goldsmith Street, E.C., London, and their offices at Shaw Lodge Mills are among the most commodious and handsome in the Halifax district. The works are situated on the canal bank and close to the railway, and offer special facilities for the direct receipt and despatch of goods by rail or water, and as the packing and forwarding arrangements are admirably organized, and the firm have always enormous stocks on hand, orders to any extent can be executed without delay. Their productions have a world wide reputation and are in steadily increasing demand. Their telegraphic addresses are Holdsworth, Halifax, and Hotspur, London.